Today I heard a strange voice coming from my room . After searching I found a small lady bird baby . It came from the window . The ladybird must have a nest somewhere near by my window . I tried to make it fly out through the window but soon I realized that it was very little and not mature enough to fly on its own . So I put it in a shoe box with some food and water so that will not starve to death . Hummingbirds are birds of the family Trochilidae, and are native only to the Americas. They are known for their ability to hover in mid-air by rapidly flapping their wings 15–80 times per second (depending on the species). Capable of sustained hovering, hummingbirds also have the ability to fly backward, being the only group of birds able to do so. 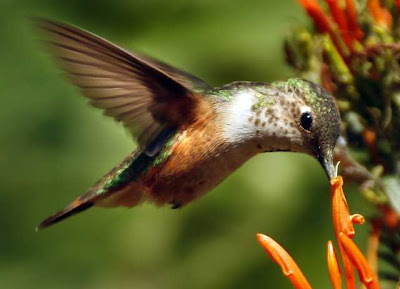 Hummingbirds may also fly vertically and laterally. Their English name derives from the characteristic hum made by their wings. Not surprisingly these birds also feed on insects specially spiders.